You may have noticed that our doctor specializes in “Orthodontics and Dentofacial Orthopedics.” While most people have heard of orthodontics, many are confused by the “dentofacial orthopedics” part of the title. Our friendly, dedicated, and energetic team is committed to working with you and your family to create a positive experience every time you visit our practice. We welcome you with warm smiles to Newton Centre Family Orthodontics! Today is a great day to start smiling! At Newton Centre Family Orthodontics, we believe that a straight, beautiful smile can enhance your self-esteem and change your life for the better. 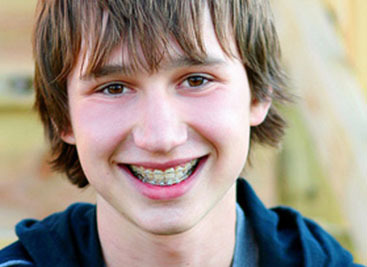 Dr. Brian H. Miller provides excellence in orthodontic care in a professional, patient-centered environment. Along with his friendly team, our orthodontist, Dr. Miller looks forward to giving you a wonderful smile you can be proud of. As our patient, you can relax knowing that your smile is in great hands! We want your orthodontic experience to exceed your expectations, from the moment you’re greeted by our front office staff to the day your braces are removed. We offer traditional metal braces as well as Invisalign and will help you decide which choice is right for you.